If you want to conquer the Mountain of Northern Vietnam, let’s come to Sapa, you will get best places all over the country for trekking. Depending on their trekking skills and ability, tourists can choose the trekking route which is most suitable, as Sapa offers a wide range of trekking spots from easy to hard level. 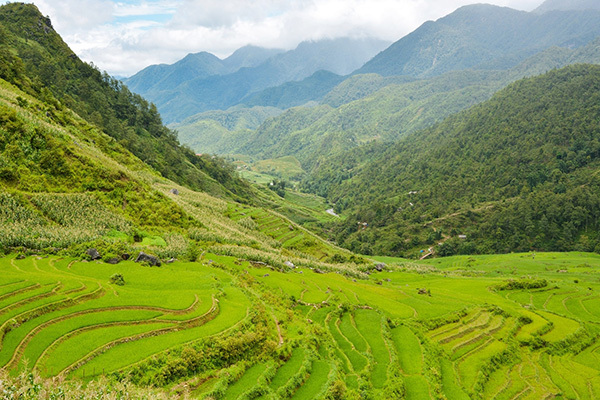 Sapa has a gorgeous landscape of mountains and rice fields, and it should be on your bucket list. It’s even considered to be one of the best trekking spots in Vietnam. Sapa is home to stunning mountain landscapes, nice rice terraces, unique villages and Fansipan peak. Thus, in this article, we offer the clear schedule for best trekking in Sapa. Starting your trip for moving towards the Tram Ton Pass where you can trek two villages as Cat Cat village and Shin Chai village. You should have an opportunity to through Cat Cat Village, just 2 kilometers trekking from Sapa Town then on the way to Sin Chai Village. Cat Cat village is known as its distinctive customs and practices kept from a long time. Come here, you will approach the life of Black H’mong people to learn about the culture. You can view the village of Sin Chai. The trip will stop at the pass for you to breathe the mountain air while viewing the mountains and forests below. Red Dao ethnic group live in this village. In Shin Chai, the woman wears the beautifully embroidered clothes with distinctive an enormous red turban and the silver jeweler so it is an attractive point. After that, you should take a walk around an ethnic minority village and interact with the local people, the very special thing is that all the kids in the village will be your companions during the adventure as you will fall in love with them. They will be around all the time, singing, dancing or anything to make you smile. Moreover, you can teach them songs, poems that you used to love when you were a child. In the afternoon, you continue driving back down to the Golden Stream and the Love Waterfall. Actually, Love Waterfall is the ideal place for relaxation because you have a chance to explore a legendary love story that has been told to generations in this land as well. If you stand from afar, the waterfall looks like a twinkling pyramid under the sun. When you stroll on the road through the forest, you will grace the beauty of flowers with the various colors, which creates the particular scenery here. Then getting Love Waterfall. After finishing the breakfast, our day 2 Hanoi to Sapa tour journey will depart with a car riding along a road get to Ban Khoan. Coming here, you will follow and climb the village of Ban Khoan where Red Dao minority lives. You have great opportunities to discover the traditional life and daily activities of local people there. After lunch, our trek will be taken through the corn-farm and the rain forests to get Ta Phin village of Red Dzao and Black Hmong tribe. Especially, there is a chance for you to get to know more about local hill-tribes as visiting their home, communicate with them, experience some of their daily activities. Ham Rong Mountain is near Sapa town, about 3 kilometers. Standing on the top of the mountain, tourists will take a sight of the whole town, Muong Hoa valley. You can grace the white clouds, which help you feel like you are in the paradise on the earth. Next, down to the Dragon Mountain, you go visit Muong Hoa valley where is one of the most famous destinations for many tourists. In the heart of the valley is Muong Hoa stream, 15 kilometers length, where is the romantic place for local couples. To cross the stream to strengthen ties with the neighbors, the local construct the wood bridges. There are many various stones with many strange words and symbols which nobody can explain. 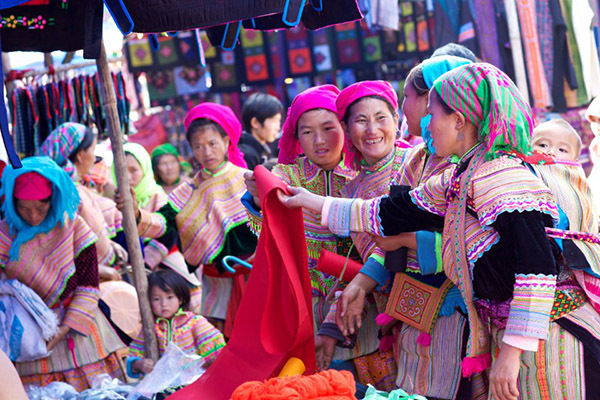 You will have a chance to experience many local festivals with multi colors when you visit Muong Hoa in the spring. Continuously, you explore other villages like Lao Chai and Giang Ta Chai where you can grace the life of ethnic minorities. Not only that, you can admire the spectacular natural scenery with the terraced rice fields. You have a chance to travel Lao Chai, Ta Van village where you can see indigo dyeing by H’mong group. Especially, you can be explained how they make their traditional clothes. Otherwise, you will visit the biggest valley which owns the golden rice terrace field in Vietnam. Then our tour tends to walk to Ta Van, a village of Dzay people. They still keep a rich and traditional culture. There are many delicious foods such as Bamboo cooked rice (Com Lam) cooked by sticky rice, five-colored “Xoi Nam Mau”, chicken of Mong ethnic people, fruits… However, street foods are not cheap. You will come back to Sapa town to visit the Sapa stone church which is located in the central position. Not only that, the backside of the church relies on Ham Rong Mountain and its front side overlooks the lowland. It is said that the direction of the church is the east, the direction of the sunrise. According to the old conception, it’s regarded as the light direction of the God that brings the good things to the humans. The Church was made from the shaped stones in combination with a mixture of sand, lime, and molasses even from the smallest details; that makes the church becomes more special. Nowadays, Sapa Stone Church is a religion for belonging people as well as locals and foreigners. Therefore, you can grace their custom. Moreover, it is also the main place for keeping many cultural traditional activities of the ethnic people in there. If you want to take the dangerous challenge in the trekking, let’s get the target in the top of Fansipan Peak called the Roof of Indochina is the most challenging level for tourists. Thus, you will need to spend two days and one night finishing the hike. 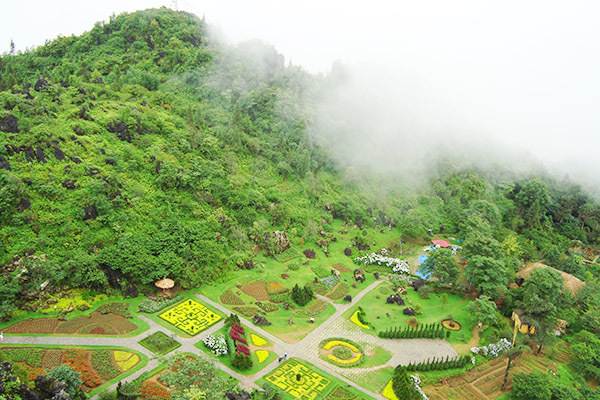 To reach the first campsite at an elevation of 2300 meters, tourists will follow the itinerary of passing Cat Cat Village, crossing Muong Hoa River and trekking upward for nearly 7 hours. The first step will be easier than other step and make the difficult to trek through the Arrowroot plantations and bamboo forests. Continuously, passing through the primary forest where people can see giant old pine trees and more bamboo. Then, tourist will climb to the peak of Fansipan, with the height of 3143 meters. The final part will take up to three hours due to the dense bamboo forest, but it is worthy as from the peak, tourists can see the best panorama of Vietnam. When catching up the top, you will have the awesome feeling like a winner. To get the best trekking in Sapa, you should bring several necessary items. You should take drinking water or you can buy it along the way. You should wear good shoes, bring a raincoat because of the changing weather. When it rains, the road will be muddy, you must walk a pole. To carry everything above you ought to choose a suitable backpack. You don’t need to bring a sleeping bag or food because in the hill tribe peoples house you would be provided with a lot of food, and there are good conditions for bathing and warm places for sleeping. You need a flashlight when going out at night. Because the trekking process wastes a lot of energy so you need to bring some food such as bread, snacks and soft drink for lunch.